Maybe I'm a masochist, but I enjoy reading business books. Invariably, when I tell people that I review them on a weekly basis, I receive an unbelieving eye-roll or a semi-sympathetic smile of pity. But the fact is, the subject of business encompasses nearly every aspect of human activity, so if you're a curious person and have the time, you can learn a lot. Business journalism may not interest everyone, but behind the dollars, statistics, posturing and press releases, there are ample stories of the drama, comedy and tragedy of human endeavor and aspiration. 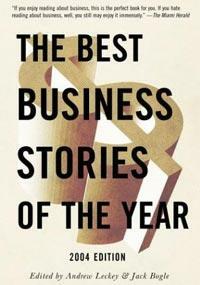 Each year, journalist Andrew Leckey, joined by a guest editor (former Vanguard Group chairman Jack Bogle, in this instance), selects the best business stories of the year (hence the title). Though ''best'' is a purely subjective determination, they apparently sift through almost every type of business writing (except one, which we'll get to later), and the result is an annual collection that is not only entertaining and enlightening, but also offers an uncanny snapshot of the state of global commerce -- and the human behavior that drives it. For example, James Stewart's Spend! Spend! Spend! Where Did Tyco's Money Go? is a breathtaking portrait of Tyco CEO (and Boca Raton resident) Dennis Kozlowski's surrealistic excesses. The rise and fall of Kozlowski, and how his wild ride was unknowingly funded by the company's stockholders, is recounted by Stewart in clear and potent prose. John Cassidy's tale of New York Attorney General Elliot Spitzer's battles with Wall Street, in particular, the incestuous -- and criminal -- relationship between investment firms' research analysts and other, sales-oriented parts of the companies. Cassidy does a fine job in sketching out the story behind the headlines. Karen Olsson's piece on Wal-Mart's labor practices, specifically how the retailing behemoth deals with labor organizing efforts, is a chilling look at the likely future facing many American workers. Also worth noting (and reading) is a powerful contribution by a team of writers from The Chicago Tribune that tells the history of the once-venerable accounting firm, Arthur Anderson, and how greed and avarice subverted its once unimpeachable reputation for scrupulous honesty. The music business has experienced an unbelievable amount of turmoil during the last year, and Charles Mann's brief The Day the Music Died shows how the business itself may be its own worst enemy by its resistance to the new technologies that might liberate it from its increasingly moribund distribution channel. Connie Bruck's portrait of the once-mighty Music Corporation of America (MCA) and its CEO, Lou Wasserman, was the basis for her book, When Hollywood Had a King, reviewed in this space last June. To sum it up, Leckey and Bogle offer a very readable and well-balanced representation of some of the year's best writing on business. They've covered most every aspect of this often unloved branch of journalism except one: business book reviews. Oh well; maybe next year!